To support this engagement with ANSAs, Geneva Call has developed a set of innovative tools to make IHL accessible to ANSA members. This set includes a mobile phone application, called ‘Fighter not Killer’. 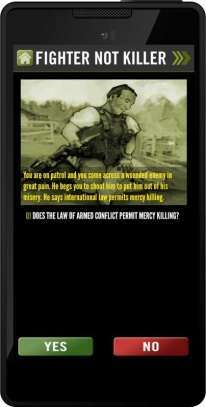 This application takes the user through 28 scenarios where a combatant is faced with complex and credible situations in which he has to make the right decision. It was developed with the support of international IHL experts and covers topics such as the conduct of hostilities, humanitarian aid, basic rights, child protection, methods of warfare and the use of weapons. No. You may not harm an enemy fighter who is defenseless due to injury. The main challenge in designing the scenarios was finding the right balance between making IHL accessible and understandable, on the one hand, and accurate and ‘legally correct’, on the other. Where IHL does allow certain types of violence, it has proven difficult in a quiz with a playful approach to inform the user that he is allowed to shoot to kill the enemy in those circumstances. The application is part of a set of tool that includes 9 short video clips and 4 illustrated booklets to disseminate and make IHL accessible to armed groups. These tools were broadly used in Syria as well as Burma/Myanmar or Sudan over the last two years. The application complements these existing tools and will be launched over the next few months in the context of the Syrian conflict first. 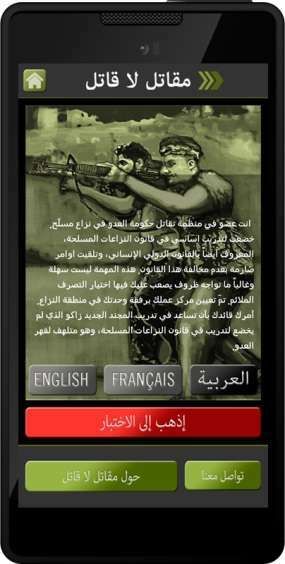 The application is available on both Android and iOS phones in three languages (Arabic, English and French) (Arabic version shown left; click image to enlarge). Some ANSAs have said they would not use it as they don’t use smartphones for security reasons. However for many of them, a mobile application is an easy way to disseminate IHL at a very low cost. “We hope to see the mobile application developed by Geneva Call given to the people even in the areas that are difficult to reach” said a leader from the Sudan Liberation Movement/Army, Geneva, November 2014. The YPJ-YPG, the main Kurdish armed forces in Syria, announced they will install this application on all new android phones sold in the areas they control. The use of smartphones has increased significantly in the past few years even in conflict-affected areas and is expected to increase further. Although its use to disseminate and promote law is increasing, its potential is still under-utilized. Fighter not Killer can be downloaded for iPhones and Android phones. This is a very convincing app.